At a cooking class in June 2014, I heard Phoebe Canakis of Phoebe’s Pure Food describe fillo shells as “a nice cheat.” This kind of shortcut is a sanity saver when it comes to entertaining. When you’re throwing a big party and have to make enough appetizers to fill a table or two, you need at least a few appetizers in the mix that only take about five seconds to make! 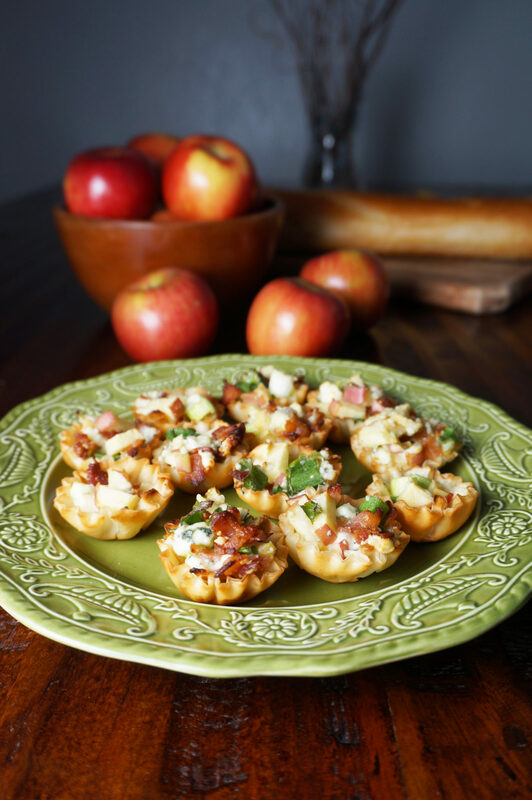 So, as we gather friends for birthday parties or harvest parties, or plan ahead for Thanksgiving or “Friendsgiving,” here are 5 crazy easy appetizers that make the most of apple season! First, the one that uses fillo shells…. Sweet and savory befriend each other in these crispy bite-sized pastries. And you get bonus host or hostess points because they just look so dainty and inviting! And Phoebe Canakis is my hero for suggesting fillo cups. Although I have worked with sheets of fillo dough and lived to tell the tale, it’s required me to set aside an entire afternoon. This took 15 minutes, including the baking time. Combine first 4 ingredients in a medium bowl. Spoon into fillo cups. Arrange on cookie sheets. Bake in 350 oven, 10 minutes or until cheese is melted and fillo cups are crisp. 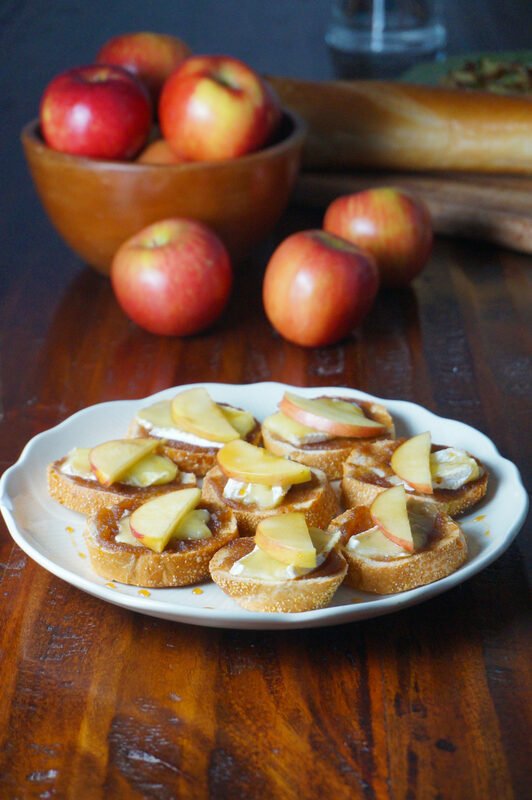 I love this recipe because it calls for not just apples but also apple butter! Did you know that in our market you can find Weaver’s own apple butter, made with apples from the orchard? Pick some up for a delicious ingredient, and then all you need are three others! If you’re feeling inspired, making baguettes is not terribly difficult. Of course, it turns this 15 minute appetizer endeavor into an 18 hour and 15 minute commitment (though not much of that is “active time.”) But if you do have the time, the taste and consistency are wonderful, and you feel like a domestic superhero. Here’s a recipe for homemade baguettes from our friends at Conebella Farm. Makes approximately 20, depending on size of baguette and thickness of slices. Slice baguette into thin rounds. Toast until lightly browned. Spread apple butter on top. Then top with a slice of brie. Warm in a 250 degree oven or toaster oven until cheese melts. Top each one with an apple slice. Drizzle with honey. Amish Peanut Butter Schmear is a favorite indulgence in this part of Pennsylvania. It’s usually a sweet mix of peanut butter and marshmallow cream. Here’s our “lightened up” recipe that keeps all the flavor. Serve it alongside the apple varieties your guests will love best! Since it’s just a matter of mixing up the ingredients, it’s a very easy. The recipe mentions Pink Lady, which are the last apples of the season to ripen and aren’t ready yet. 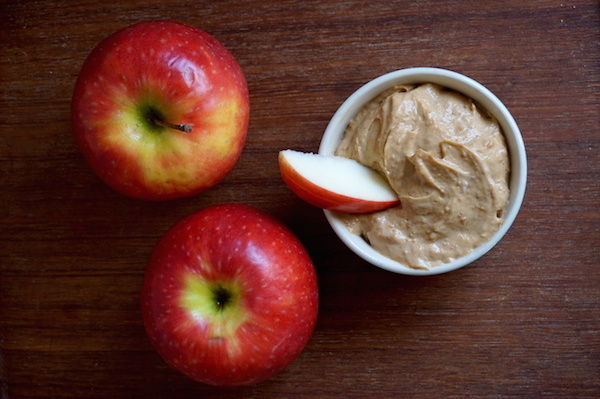 Really, this apple dip tastes great with any apple you’d like to use! For a sweet appetizer or dessert, make these fritters! They taste like yeast donuts but don’t take as long to make since it’s baking powder, rather than yeast, that makes them rise. They have a pleasant fresh apple flavor because the apples get soft and warm but not as soft as they would in a pie. 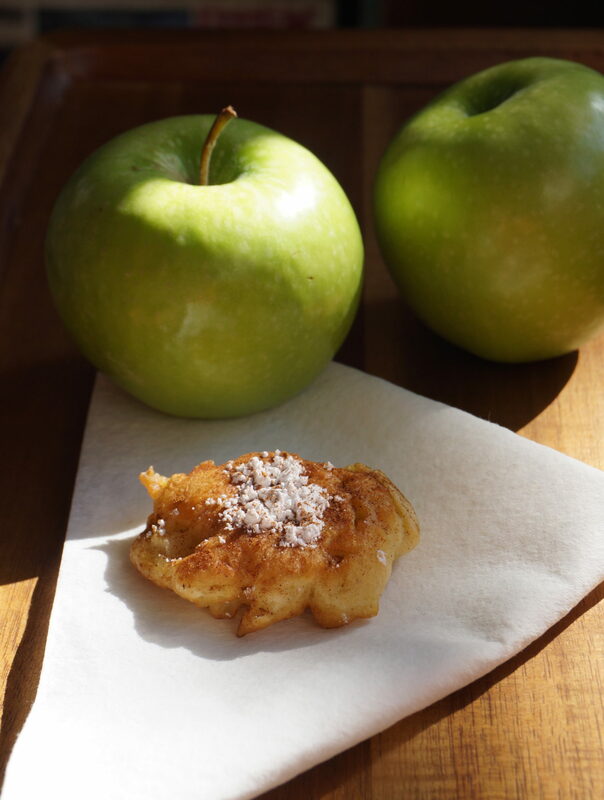 I used Granny Smith apples to make these and liked the contrast of sweet dough and tart apple. Crimson Crisp is another tart apple that is available in pick-your-own now through 10/6 (most likely longer in the market). 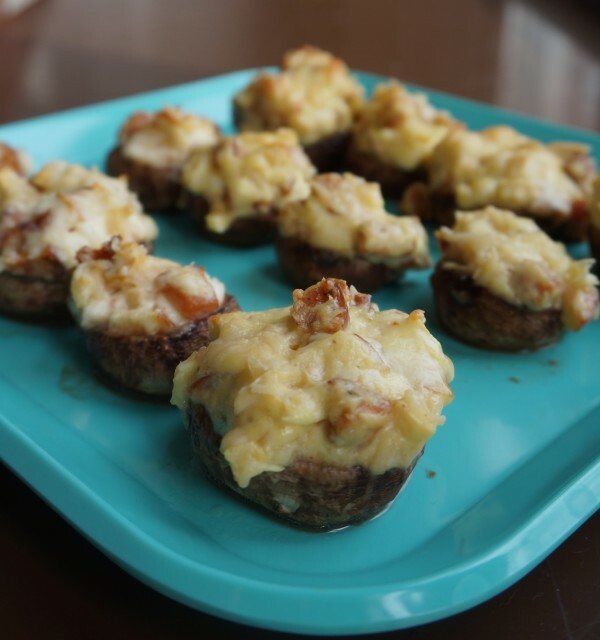 Add this easy-to-make, healthy and crowd-pleasing appetizer to your spread! The filling also works as a dip to serve with chips, crackers or veggies. Attending a party instead of giving one? Bring a hostess gift! Edie Esh, who has worked at Weaver’s Orchard for 22 years, has great ideas for what to bring.